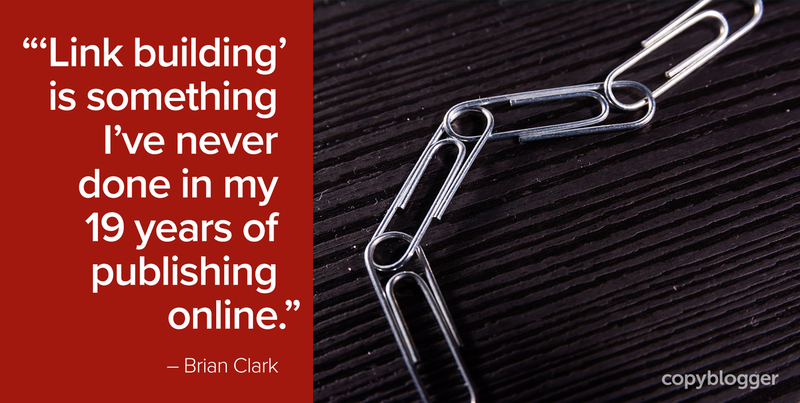 “Link building” is something I’ve never done in my 19 years of publishing online. In other words, I’ve never spent any time whatsoever emailing strangers and trying to convince them to link to my content. I have, however, been on the receiving end of many link-building requests. And they’ve never worked on me. Now, I know there are smart people who work on behalf of clients to get links through these outreach initiatives. Strangely, I’ve never received a link request from a smart person. It’s usually just dopey people using bad email scripts and automation that some clown sold them on. They don’t even bother to modify the language, so you see the same lame emails over and over. Outside of receiving compensation for a link (which I would never accept and is just a bad idea in general these days), I don’t see why any online publisher would agree to these requests. What’s in it for us? So, if you’re looking to get links to your site for all the benefits that come with it (including enhanced search rankings), maybe you should try a different approach. Let’s look at three that might work for you. Not a new approach, certainly. But guest writing for relevant and respected publications remains one of the best ways to gain exposure to an audience that builds your own. And of course you’ll want, at minimum, a bio link back to your site in exchange for your content contribution. Now, you may remember that Google at one point spoke out against guest posting for SEO. Yes, spammy sites submitting spam to other spammy sites in exchange for links is not smart — but that’s not what we’re talking about. I’m also not necessarily talking about content farms like Forbes and Business Insider, although if that’s where your desired audience is, go for it. You’ll likely have better luck, however, with beloved niche publications that cater to the people you’re after. What you’re looking for is a place that you can contribute on a regular basis, rather than a one-shot. Not only will the audience begin to get familiar with you after repeat appearances, the publisher will value and trust you, which can lead to coveted in-content links to relevant resources on your site rather than just the bio link. What if a publisher doesn’t allow links back to your site? Move on. It’s not just about SEO — if a reader is interested in seeing more of your work, they should be able to simply click a link to do so. That’s how the web works. If you’re limited to a bio link, see if you can point to something more valuable than your home page. A free guide or course that gets people onto your email list is the primary goal ahead of SEO. The explosion of podcasting, especially the interview format, is a potential boon for exposure and links. In short, podcasters need a constant supply of guests, and you should position yourself as a viable option. The links appear in the show notes, and this can be a great way to get citations to your home page, your valuable opt-in content, and your most impactful articles. But you have to find a way to get on the show in the first place. This may be more doable than you think, because as I said, podcasters need a constant supply of fresh guests. And take it from me — we’re looking for new and interesting people outside of the typical echo chamber that exists in every niche. For example, recently Joanna Wiebe of Copy Hackers introduced me to Talia Wolf, someone I was unfamiliar with. I trust and respect Joanna, so I checked out Talia. Next thing you know, I’m interviewing Talia (you can listen to her episode here) and I ended up linking to three of her articles as well as a page that contains her free conversion optimization resources. Take the time to understand the show, its audience, and its host. Send a friendly note explaining why you would be a solid interview. Don’t be shy; it’s just a (well-written) email, and podcasters want you to convince them to be their next guest. Or get someone who knows both your work and the host to recommend you. There are even podcast interview booking agencies cropping up that will do the outreach for you. In the early days of Copyblogger, it was all about creating hugely valuable tutorial content that naturally attracted links. It’s harder these days, because most people tend to share that type of content on social channels rather than blog about it like back in the day. You can still make it happen, though, with the right content and the right relationships with other publishers in your niche. It hinges on leveraging the powerful influence principle of unity, or our tribal affiliations with like-minded people. Tribal content is all about resonating strongly with people who believe the way you do on a particular issue. For example, one of our prime tribal themes involves the dangers of digital sharecropping, or publishing content exclusively on digital land that you don’t own and control. We didn’t coin the term (Nicholas Carr did), but often when the topic comes up, there will be a mention of Copyblogger. It works the other way, too. Whenever I see a solid piece of content that warns against digital sharecropping, I share it on social. And there’s a good chance I’ll link to it as outside support the next time we talk about the topic. You know, like this and this. If there is an important worldview within your niche or industry that other online publishers share, it’s likely important that they make the case to their audiences. With tribal content, you’re providing an important message that supports part of their editorial strategy as well as your own. That’s how the truly powerful links to your site happen. So start making a list of unifying concepts that you share with others in your arena, and make sure your relationships with those publishers are solid before you unleash your epic tribal content. Now that I think about it, one link-building email almost worked on me. It was one of those cookie-cutter templates asking me to swap out a link in the web archive of my personal development newsletter Further. When you curate content as I do with Further, linking to other people’s stuff is what it’s all about. So I took a look at the suggested resource, and it was surprisingly good. I wrote back to say I wasn’t going to replace the old link, but I would include her resource in the next issue. Unfortunately, this person didn’t respond over the next several days. What I got instead, just a day before publication, was the next automated email in her sequence, asking me if I had seen the original email that I had already replied to. Deleted that email, deleted the link to her resource in the draft issue, and included something else instead. Thank you! Incoming links are absolutely the biggest weakness in my whole internet strategy. All 3 methods entail the forming (or utilizing) of personal relationships, which makes sense to me. Now, more than ever, people want to associate themselves with individuals they can trust – and so, automation should be reserved for (certain) tasks, not end results. Even in the digital sales process, customers expect some level of human support that extends beyond their purchase. Mario, that’s exactly right. I think some people are under the impression that since this is digital, real-world relationships don’t matter. They matter a lot. Thank you for this post! it has been very helpful. Getting links coming is can prove to be difficult at times. I’ll be adapting my strategy after reading this. But it is the best way to get to know people and to create a link to people to your own website. It’s the same as networking when you go to work but it’s digital. For beginners, it’s one of the biggest challenges. People are striving to get some quality backlinks. Guest posting can be a thing to look forward to. But many bloggers are using it the wrong way. It’s not only about building links, it’s about connecting with a different audience. I have never given a thought about podcasting but it can be a great idea. Thanks for sharing these strategies. Thanks for this detailed and informative post. These are some of the best ways to get links for our website or Blog. I find guest post is one of the best way to get links and it also helps to increase the authority of your blog. I have never tried podcasting, but will definitely look in to this. 1. Any B2C podcast you have found to be good? 2. While podcasts work in countries like USA, UK, Australia, Singapore. How do you think podcasts would work in a country like India, especially in a B2C niche? Good tips for getting backlinks. Guest posting is tried and true but can be difficult for those starting out. It is also important to make sure you have a website that is worth link back to! Doing all the work getting backlinks just for a terrible site is not worth the time. Brian, I read your post and swore I remembered you telling stories about how you asked for links in the early days of Copyblogger. Wow, you’ve been giving the same solid advice for a very long time! Thanks for the amazing article! It shows that real life networking is really important for your online business. To improve our branding we should stay connected with the person in same niche. It is easy to get links as long as you continue to produce valuable content. Once people see the value in your content, they will link to you naturally – that is more valuable than any link you build. I love your article. The end is hilarious. Thanks for putting a few straight. It’s amazing how many people forget that life is about the relationships. It doesn’t matter if they are online or in real life. Automation helps to amplify everything, including people’s stupidity. Automation helps to amplify everything, including people’s stupidity. … wins our coveted “comment of the year” award. Well done, Kerstin. Some useful tips again as usual but unfortunately not a lot of blogs open their doors to guest blogging for beginners. Very rightly so as they have lot of other bloggers who have been contributing for years and years, so it will be an unfair decision to choose a beginner over them. Here blog commenting plays an important role for the beginners like us to reach to well established bloggers. Drop some valuable comments and get yourself noticed before you could again ask them for guest blogging. Thank you, this is really useful. We are trying to look at ways of building links naturally, and it’s quite time consuming! Don’t get me wrong, I enjoy writing content and it’s great when our articles or other content is linked to or shared, but getting to that point can be difficult. As you mentioned, blog publishers probably get hundreds of requests about this topic, and it’s trying to stand out from the crowd that’s the key. I suppose I just have to accept it takes time! It is in GIVING that we GET. Which is why your post rocks. I have received at least 1 cookie cutter request for links over the past few years. OK, 100. OK, probably more. Sometimes I help, offering advice that directs these folks to give, to make friends, then the getting becomes easier. And lasting. I really like your posts especially which are about writing content and marketing, keep up the good work Brian. These days people really don’t link back to one’s content even and its all about making links in reality with them which gets the thing going.